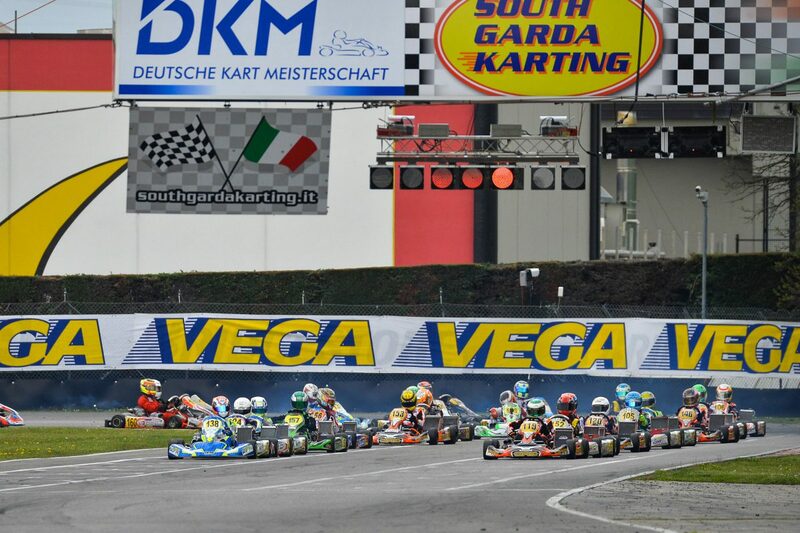 Deutsche Kart Meisterschaft (DKM) is Germany’s national karting championship and is widely considered the most competitive and best national championship. 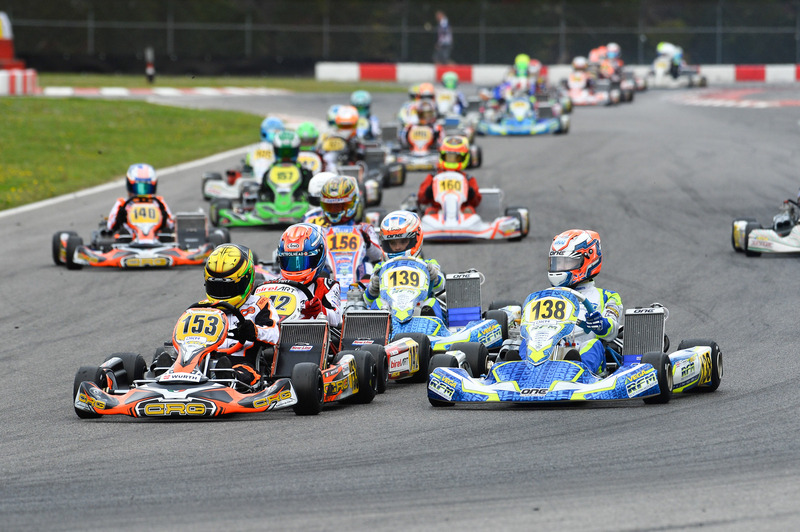 The DKM is held over five rounds, three in Germany and two elsewhere in Europe and is now in its 56th year. 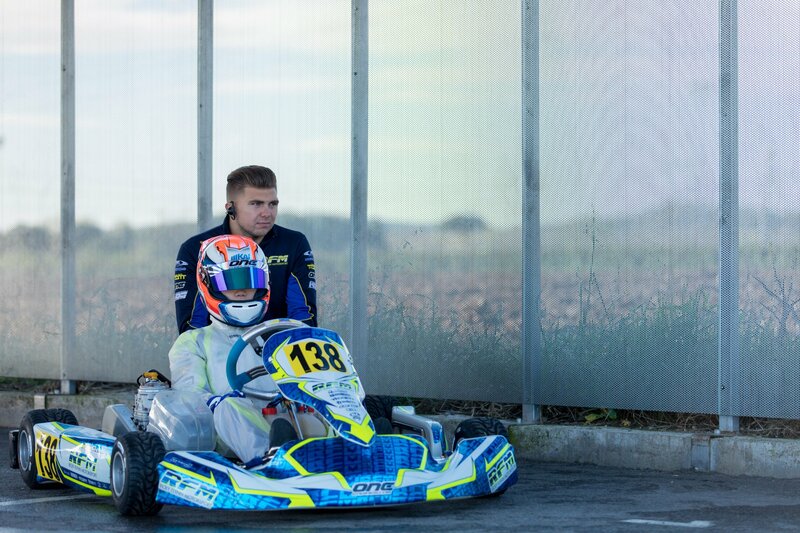 Round one took place at the famous South Garda Karting circuit in Lonato, Italy. 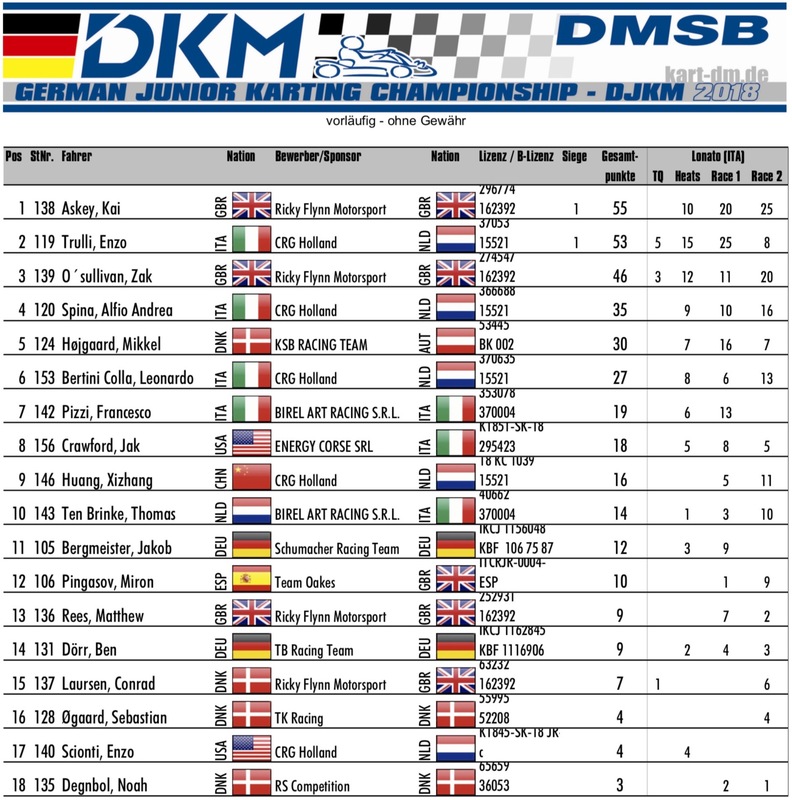 This first round of DKM saw over 200 drivers, with 47 in Kai’s category, OK Junior (DJKM). 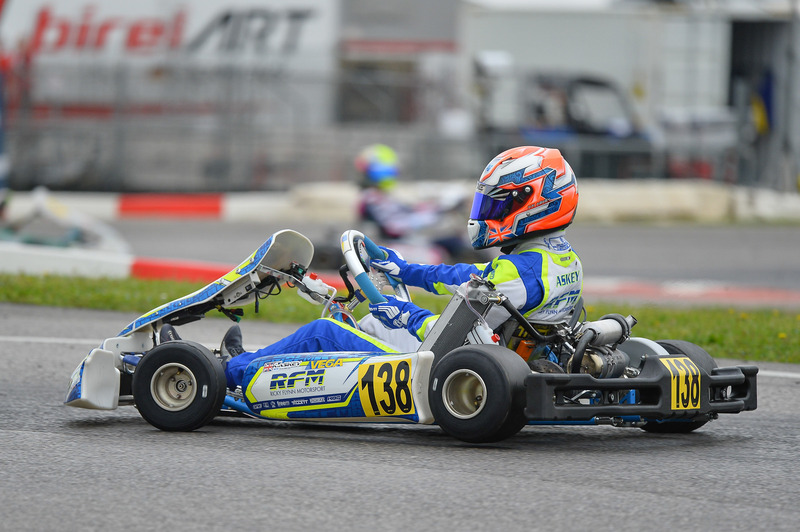 Kai’s last race at the track was the South Garda Winter Cup where he finished 6th from 9th on the grid. DKM has a three day structure; practice on Friday, qualifying & heats on Saturday and finals on Sunday. After a good day of practice Kai was feeling confident going in to qualifying and his pace showed quickly achieving his fastest lap of 47.751 (average 90.5 kph) on lap 5. After the results from both qualifying groups were merged Kai placed fourth (of 47) behind his team mates Zak O’Sullivan and Conrad Laursen, with just 0.046 sec covering the top four drivers. The 47 drivers were then split into three heat groups (A, B & C) to compete against each other in a total of three heat races. Kai’s two eight lap heat races took place in the late afternoon of the Saturday. In his first Kai managed to make up two places to finish 2nd just behind Enzo Trulli, son of former Formula One driver Jarno Trulli. In his second heat Kai finished 3rd again behind Enzo but just in front of his team mate Zak. 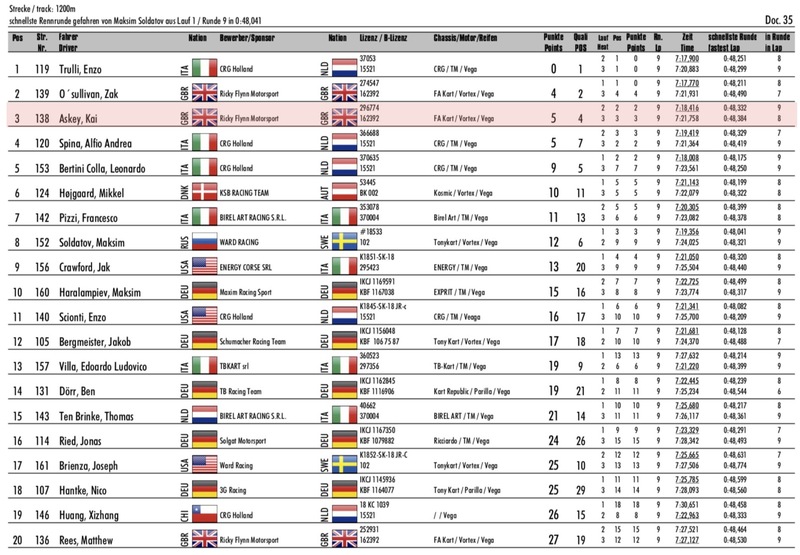 On a total of five points from his heats Kai was placed 3rd overall just in front of Alfio Spina who had the same points but had qualified lower. Each DKM round features two 17 lap final races (34 drivers) with trophies and equal points awarded for each (although the second final is considered the more ‘prestigious’). Kai started the first final in 3rd position and made a good start moving into 2nd by the first corner and despite pressure from behind managed to hold his position, gradually catching the leader Enzo Trulli. At one point Kai passed Trulli but he took it back before the line for a 2nd place for Kai. Kai started the second final in 2nd place, the start was much harder and Kai slotted into 5th place, over the next fifteen laps he moved forward eventually catching the leader, then Maksim Soldatov who had earlier been involved in an incident with Francesco Pizzi (now out of the race). Kai crossed the line 2nd behind Soldatov but was promoted to 1st due to a penalty applied to Soldatov for the incident with Pizzi. Great, consistent driving and hard racing all weekend by Kai rewarded him with a 2nd and 1st in the finals and the early DKM German Championship leader with 55 points. The next round of DKM will be in Germany at the Wackersdorf kart circuit in May.